Luang Phu Toop was acclaimed by devotees for his powerful Wicha Akom, and was the creator of a vast range of different amulets, all of which are now extremely rare to encounter, and highly prized within his cult inner circle of collectors and devotees. Luang Phu Toop was born in Tambon Bang Luang Iang in Ayuttaya, on he 11th of April 2411 BE. His Father was called ‘Dech’ and Mother went under the name of ‘Phong’. Luang Phu Toop lost his parents about the time of hs first birthday, after which he stayed with relatives in Bangkok, who were Lordly Family Lineage, namely Jao Praya Racha Supamidtr, and Tan Phu Hying Plaek. Luang Phu Toop learned Khom Agkhara Script and Pali Sanskrit at an early age as he was still attending school, at the temple close by to his relatives home. In the year 2463, Luang Phu Toop ordained at Wat Suntorn Dhamma Dhana (pronounced ‘Wat Suntorn Tamma Tan’ in Thai), popularly known as Wat Kae Nang Lerng. HIs Upachaya Ordaining Officer was tan Jao Kun Tamma Warodom, the Abbot of Wat Benjamabopit. 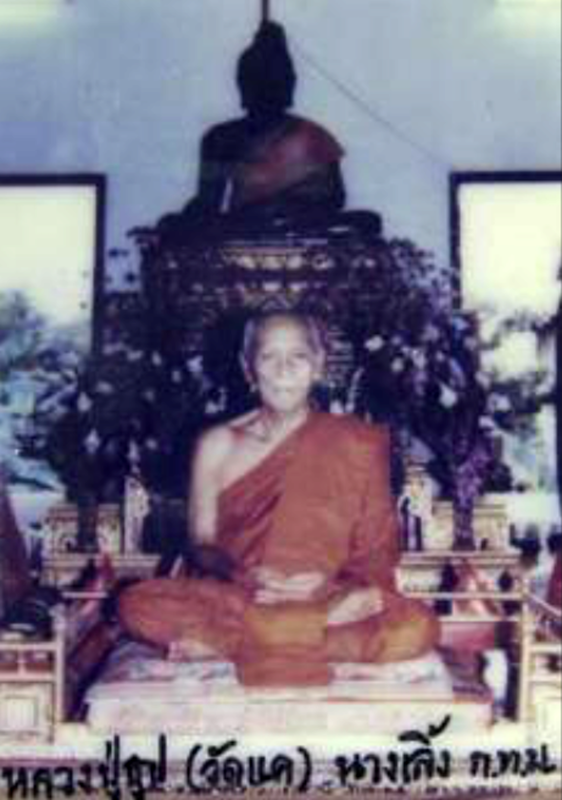 His Pra Gamma Wājājarn was Pra Ariya Muni, the Abbot of Wat Tewarachagunchorn. Pra Kroo Puttaban (Luang Por Naedtr), the Abbot of Wat Sontorn Tamma Tan was his Pra Anusawanajarn Witness. He received the ‘Chāyā’ (Ordained Monk’s name), of ‘Khema Siri’. 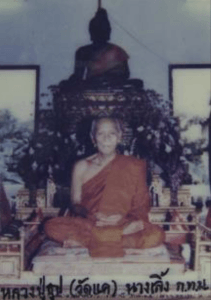 Once he was Ordained, Luang Phu Toop studied Kammathāna Vipassanā, and Dhamma, and Putākom (Buddha Magic) with the Great Luang Por Parn of Wat Bang Nom Kho in Ayuttaya for a long time. After Luang Phu Yoop returned back to Bangkok thereafter, he would still return often throughout the years, to continue his studies with Luang Por Parn. As time went on, Luang Phu Toop came to become friends with Luang Por Khant of Wat Nok Grajarp, who introduced him to the ‘Wicha Chueak Kart Aew’ (magical cord belt making), which he mastered under the tutelage of Luang Por Khant. Luang Phu Toop also went on to master a number of other magical Wicha with the great Luang Por Chaem of Wat Ta Gong in Nakorn Pathom, and with the Legendary Luang Por Ngern of Wat Don Yai Horm, because Luang Por Ngern would often visit wat Ta Gong to see Luang Por Chaem, and so Luang Phu Toop was blessed to receive Wicha from both of these Immensely Powerful Sorceror Monks. Luang Phu Toop was a very diligent monk who would accept and fulfil all the requests he received from his superiors, and was never lazy or selfish in his behaviour. He became highly respected and beloved by his companions in the Sangha during his early years as a Samanera Novice Monk, and was a shining example to the other Novice Monks, inspiring and driving them to excel in their duties. Luang Phu Toop was responsible for a great deal of helpful activities in assisting the Abbot of Wat Kae Nang Lerng in the development of the temple, and eventually was elected Vice Abbot. In the year 2471 BE, Luang Phu Toop was elected to become the Abbot of Wat Sontorn Tamma Tan (Wat Kae Nang Lerng), and developed the Temple until it grew to become a Great Temple, as seen today, and in the Year 2477 BE, he was given the Honorable Official Status of Pra Kroo Sanya Badtr. Consequently, in the Year 2495 BE, he was given the Official Status of Pra Racha Kana (Bishop) by Royal Decree. Luang Phu Toop is known for his many different Amulets which he created, which he began to make in the Year 2482 BE, by co-creating an edition with the Legendary Luang Por Chaem of Wat Ta Gong. This first edition was the Pra Somdej Sam Chan Buddha on 3 Tiered Dais, The Pra Rod Buddha Amulet, The Pra Pim Nang Kwak Supawadee Amulet. All of these Amulets were created in Nuea Pong Pasom Din Buchaniyasathan (Muan Sarn Sacred Powders mixed with earths from Sacred Shrines), and also in a second Sacred Substance, namely Pong Bailan Long Rak Chab Nuea Nai Si Dork Tao (Black Parchment Powders with Lacquered Surface and Gray Inner Color). All models had deep hand spell inscriptions in the rear face. Every time Luang Phu Toop created an Edition of Amulets, he would distribute them to devotees who came to the temple and helped out. The Amulets which remained left over afterwards would be then hidden in the base of the Buddha Statue within the Uposatha Shrine Room. The Amulets of Luang Phu Toop include Sacred Powder Amulets, Chueak kart Aew Magic Cord Belts with Takrut. His most famous editions are the 2504 and 2513 Editions. The 2513 Edition saw his first edition Guru Monk Coin released, which is a Highly Preferred Pra Niyom Master Class Amulet.